This ain't Grandma's material anymore, bless her heart. Our first NBT (next big thing) is Caning – in all its delicate, textural, organic glory. This stuff is old, y’all. Some was even found in King Tut’s tomb! Around since the 2nd century, caning describes the process of weaving cane (specifically the outer material of the rattan stalk) into furniture seats, backs or other decorative surfaces. 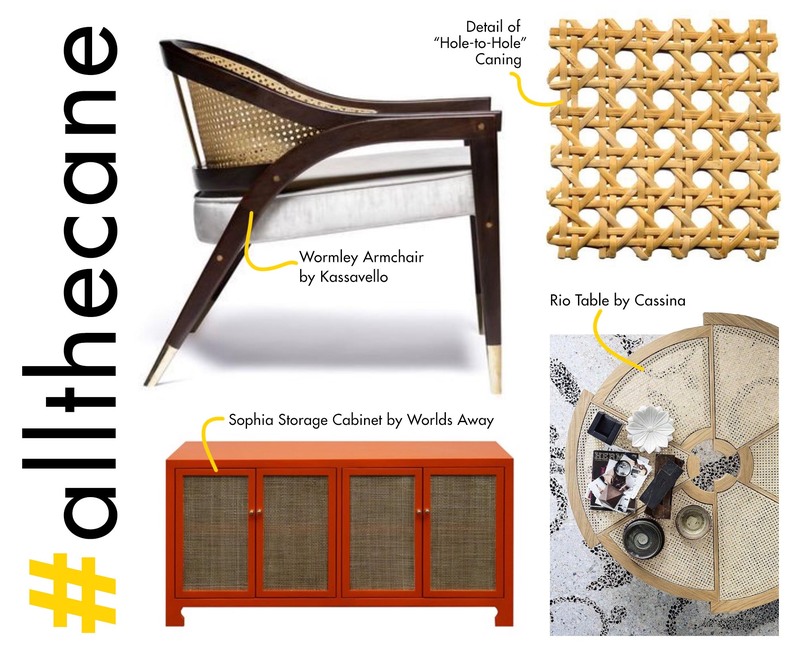 For those of you imagining your grandmother’s outdoor rattan furniture think again! There are tons of different patterns around. The most popular of which is called “hole-to-hole” and is available just about everywhere we look! As you can see this caning style creates a distinctive series of octagonal holes. And we are all obsessed with octagons right?! Bonus: hole-to-hole is also considered the most durable of the caning styles. A few examples of hole-to-hole caning. Bask in all of its glory. While we love caning for its ability to provide lightness, elasticity and clean lines the Victorians loved it for a different reason. At that time caned furniture was prized for its lightweight, durable and hygienic properties. Think hot, humid, tropical colonies where wood would warp or crack. Caning provided a less formal look to the heavily used upholstered furniture and the preferred design was called close-woven caning. As you can see in the image below the octagons have disappeared and the weave is tightly filled in. As with most things – today anything goes! We’ve been inspired by everything from this modern chair by Industry West to Peg Woodworking’s faux cane using cotton cord in lieu of rattan strips. Even major manufacturers are getting on the trend including IKEA, CB2 and Urban Outfitters. 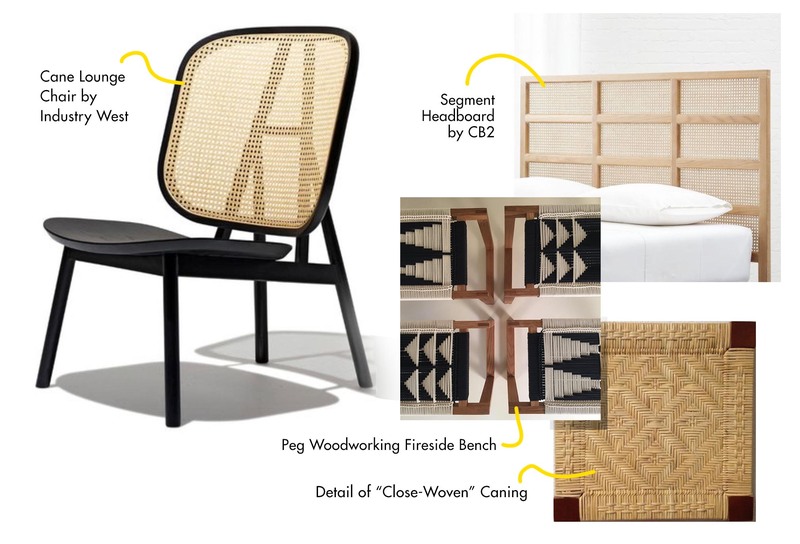 A few trend-forward examples of manufacturers using cane in furniture. 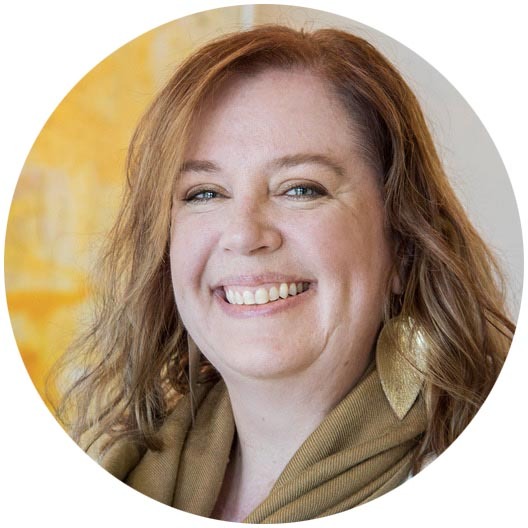 Paige Neagle is a senior interior designer with over 20 years of design experience. She is dedicated to working with owners to create spaces that combine style, regional relevance and story-telling. She also brings an adventurous energy to each project and strives to bring comfort, beauty and care to those around her.